(flying) "It's like you've been allowed to enter a sacred, private world in which all the beauty is yours." McCONKEY, Mary C. Wilson 87, of Springfield and formerly of Clifton passed away Wednesday evening, March 26, 2008 in the Eaglewood Care Center. She was born February 24, 1921 in Springfield, the daughter of William H. and Mary Catherine (Dean) Wilson. Mary grew up on South Limestone Street in Springfield and as a young college student she worked and saved money so she could take flying lessons at the Springfield Airport. Mary C. signed up to become a member of the WASP-Women Airforce Service Pilots, a program of the US Army Air Force. She completed her flying training at Avenger Field in Sweetwater, Texas in February of 1943. 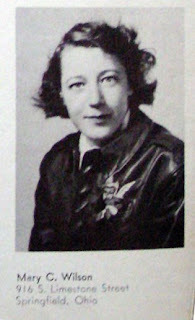 Mary was one of the select groups of only 1,102 women to first fly American military aircraft. Mary and the WASP of World War II were true trailblazers. They flew every type of aircrafts on every type of mission except combat. Mary C. was proud that she had contributed to the war effort by training pilots, flying surveillance and ferrying planes to strategic locations. Her love of flying is captured by this quote she made in an article written about her in the Springfield News Sun in 1993: "It's like you've been allowed to enter a sacred, private world in which all the beauty is yours." Mary was preceded in death by her loving husband, Wayne R. McConkey and sisters, Frances Wilson Fried Smith and Jane Wilson Austin Montgomery. Over the past years, she has resided at the Eaglewood Care Center and been looked after by her nephew, John B. Fried of Columbus. She will be sadly missed by John's family and her other nephews, Dean Wilson Fried of Columbus and Carl K. Fried of Florida; her dearly loved niece, Patti Austin Meyer and her family of Willoughby, Ohio. A graveside service will be held on Saturday, March 29, 2008 at 1 p.m. in the Clifton Cemetery with Pastor Arby Conn officiating. Family is being served by the LITTLETON & RUE FUNERAL HOME. You may express condolences to the family.